Juve coach Massimiliano Allegri set up his team to play a high line and put pressure on their Spanish opponents from the first whistle, with the onus on full-backs Leonardo Spinazzola and Joao Cancelo to advance forward as often as possible. The home side thought that tactic had paid off early when captain Giorgio Chiellini poked home in the fourth minute. However, following a VAR review it was declared that Ronaldo had fouled Jan Oblak in the build-up. 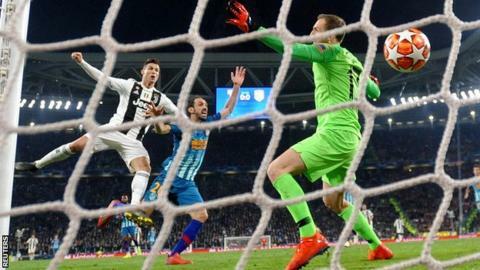 There was no need to refer to VAR when Juve next had the ball in the net through Ronaldo's first header past the Slovenian keeper. It gave the home fans, who were handed 30,000 flags to wave, hope that their side could produce one of the great Champions League fightbacks in recent times. That became more likely soon after the restart when Ronaldo headed in his second. It was Cancelo who supplied the cross on this occasion. Oblak appeared to claw his effort off the line before goal-line technology alerted referee Bjorn Kuipers that the goal was good by a matter of inches. For the winner, former Fiorentina player Bernardeschi was pushed inside the area by his tracker Angel Correa after making a 50-yard run - the Juve crowd held their breath for a second before the Dutch official pointed to the spot. It was left for Ronaldo to crown a memorable display by himself and his team by firing his spot-kick to the right of Oblak. Allegri praised his side's measured approach to the task. "The players have shown great maturity," he said. "There was the risk of having a hysterical match, as if everything had to be done in 10 minutes." It was perhaps a surprise that Diego Simeone's Atletico were overwhelmed so easily. Since the start of the 2013-14 campaign, they have kept more clean sheets than any other team in the Champions League (34) but on Tuesday La Liga's second-placed side looked likely to concede whenever Juve flung the ball in from the wings. It was expected they would concede the lion's share of possession, but on the rare occasions they did have the ball the three-time finalists were both pedestrian and sloppy. One moment of carelessness led to the opening goal when Alvaro Morata, who started alongside Antoine Griezmann up front, misplaced a header which allowed Emre Can to start the Juve attack. Morata also had his side's best effort when he headed over from six yards. Manager Simeone said: "I don't think it was our worst performance, nor did I see a lack of character. They simply played better and we have to congratulate them." Juventus have progressed in a Champions League knockout tie having lost the first leg for the first time since 2005-06 v Werder Bremen. Atletico are the fourth team in Champions League history to win the first leg of a knockout game at home by a 2-0 scoreline but fail to progress to the next round. Atletico failed to have a shot on target in a Champions League game for the first time since December 2008 v Marseille. Chiellini is the fifth player reach 500 appearances for Juventus in all competitions after Alessandro del Piero, Gianluigi Buffon, Gaetano Scirea and Giuseppe Furino. Match ends, Juventus 3, Atlético de Madrid 0. Second Half ends, Juventus 3, Atlético de Madrid 0. Corner, Juventus. Conceded by Ángel Correa. Vitolo (Atlético de Madrid) is shown the yellow card. Paulo Dybala (Juventus) wins a free kick on the right wing. Goal! Juventus 3, Atlético de Madrid 0. Cristiano Ronaldo (Juventus) converts the penalty with a right footed shot to the bottom left corner. José Giménez (Atlético de Madrid) is shown the yellow card. Penalty Juventus. Federico Bernardeschi draws a foul in the penalty area. Penalty conceded by Ángel Correa (Atlético de Madrid) after a foul in the penalty area. Attempt missed. Moise Kean (Juventus) left footed shot from the left side of the box is close, but misses to the right. Substitution, Atlético de Madrid. Vitolo replaces Santiago Arias. Attempt missed. Mario Mandzukic (Juventus) right footed shot from the left side of the six yard box is close, but misses to the left. Assisted by Miralem Pjanic with a cross following a set piece situation. Substitution, Juventus. Paulo Dybala replaces Leonardo Spinazzola.